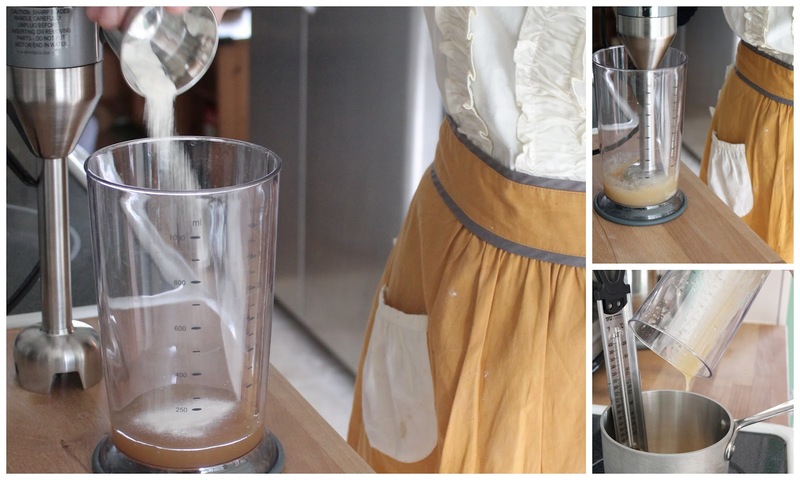 This is the third post in a series about planning a molecular gastronomy dinner party. Click here to read the first post about the blueprint for the big feast. These posts are also being featured on food52! Spherification, the process of turning a liquid into little caviar-like spheres that pop in your mouth, was one of the techniques I was most excited to try out for my molecular gastronomy dinner party. I had never tasted anything prepared in this way, but, much like with the powdered olive oil, I was in love with the gimmick. Maybe it’s not everyone’s cup of tea, but I totally dig the idea of serving something familiar and delicious in a completely new way. Again, I have to credit Top Chef for the inspiration. Chef Grayson Schmitz made a dish with a dill caviar, and explained that spherification was one of the easier molecular gastronomy techniques. Awesome! Super cool and easy to make? I was sold. I knew I wanted to make spheres as an accompaniment to something on the cheese plate course. I searched online for ideas, and found a beautiful recipe for prosciutto with cantaloupe spheres – a simplified version of a dish served at El Bulli. But I had to abandon this idea when I learned that the birthday boy didn’t like cantaloupe. 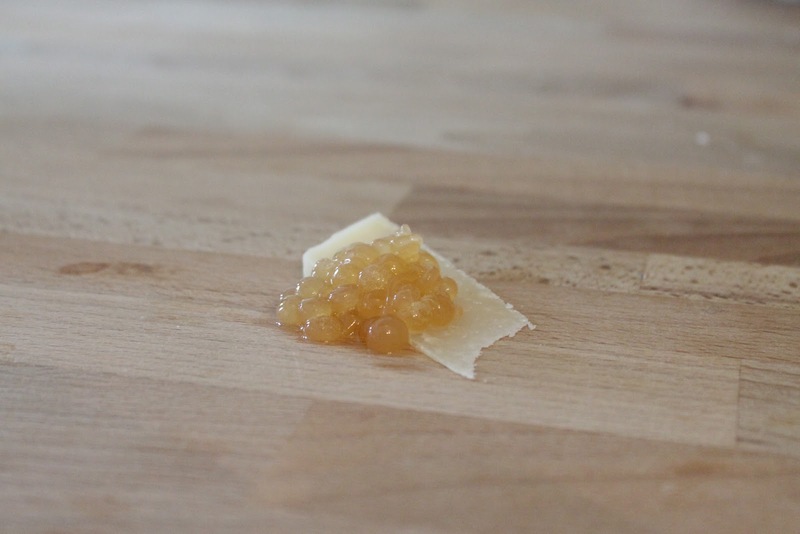 So, I decided to keep it simple and make a honey caviar to serve on slivers of Iberico- a semi-firm, manchego-like Spanish cheese. Just for fun, and to practice the technique, I decided to make an apple juice caviar. (Note: The recipe I used was from Sketchy’s Kitchen, but that post is no longer available after a site upgrade.) Here’s what happened! The ingredient shot. 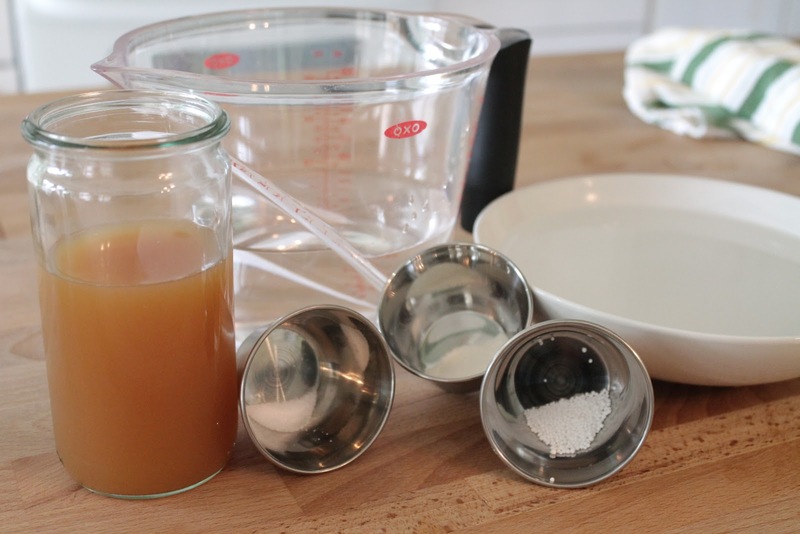 8 ounces apple juice, 1/2 tsp sodium alginate, 1/8 tsp sodium citrate, 2 cups of water, 1/2 tsp calcium chloride, plus an additional water bath. 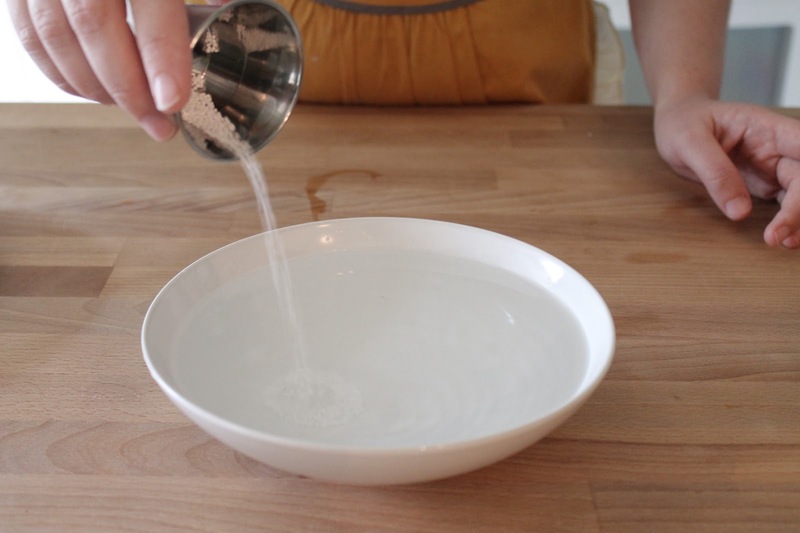 Basic spherification requires only that you mix an alginate with a liquid and drop that mixture into a calcium bath. But! If your liquid is too acidic (has a pH above 5), your spheres won’t form unless you add sodium citrate. So if you’re experimenting with different liquids, you’re probably going to need to find yourself some pH paper. 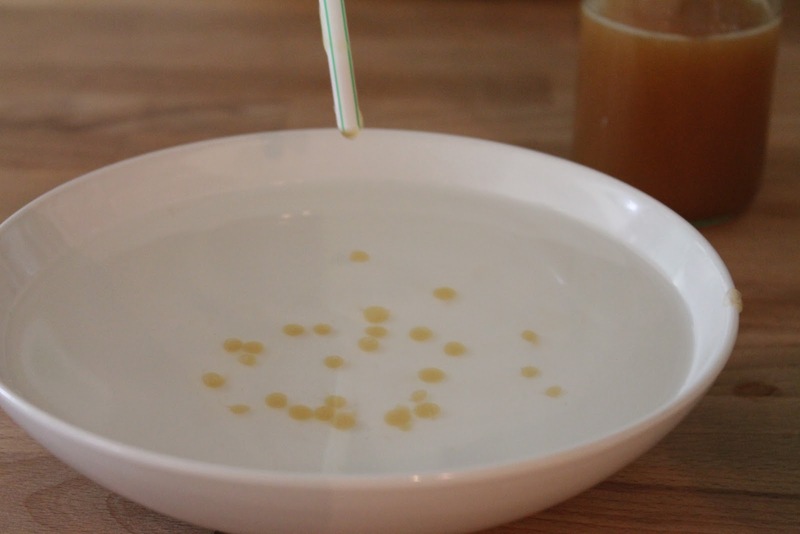 I thought I would just be able to mix the sodium alginate into the apple juice with a few quick strokes of a fork, but alas. Turns out the alginate is very reluctant to dissolve, so you’ve got to mix it into a third of your juice using an immersion blender (a process that can take up to a minute). Then, since you’ve aerated the mixture so much, you’ve either got to wait 12 hours or so for the bubbles to leave the liquid (bubbles = bad spheres), or else heat the mixture to 205 degrees. This didn’t seem like the easy technique I’d signed up for. 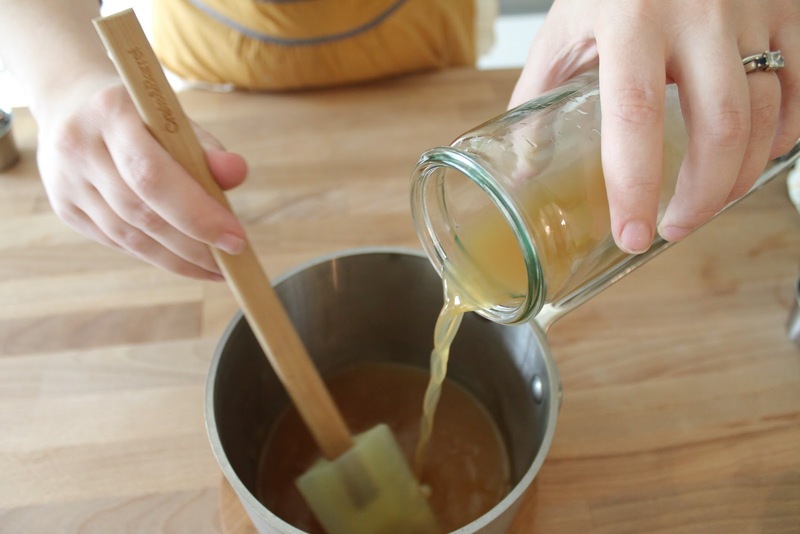 Once the mixture reached 205 degrees, I stirred in the rest of the apple juice and the sodium citrate, and then refrigerated the liquid until it had cooled down to near room temperature. Ok. I didn’t buy the syringe you’re supposed to used to make these spheres. I thought I could just use a pipette, or failing that, a plastic squeeze bottle. These both failed miserably. The pipette made drops that were way too tiny and hardened almost as soon as they hit the water. The squeeze bottle made long ropy noodles of apple juice which were actually kind of cool, but looked completely horrifying. The winning sphere-ifier turned out to be a plain old drinking straw! I just held my finger over the top of the straw and let the juice slip out one drop at a time. This worked, and was free, but I’d have liked to have the syringe. You’ve got to drop the liquid into the calcium bath pretty rapidly, because if the spheres sit in the bath for too long (more than about 45 seconds or so), then they’ll turn into completely solid goo-balls instead of the thin-skinned caviar filled with juice you’re going for. So, after 45 seconds, you hurriedly scoop the spheres out of the bath with your slotted spoon. (Again, you should buy the spoon with tiny holes that was made for this job. I thought I could get by with my tiny sieve, but it was a nightmare trying to chase those spheres around the bowl.) And, at last, ta da! Apple juice spheres on a slice of parmesan! So, yay! We had spheres! And they are really fun little pops of apple juice caviar. But man oh man, this was not at all the breezy technique I had envisioned! It’s really finicky work. In addition to the pH-finding, immersion blending, heating, chilling, careful and rapid dropping, and quick removing, it absolutely has to be done at the last minute because those spheres will continue to harden after they’re removed from the calcium bath, even if you rinse them in water. That meant I would have to make my honey spheres table-side during the dinner party. But hey- the spheres are totally fun, and it’s a Science! dinner party after all, so a little experimentation at the table would be just fine.